'Statements of Purpose' for all ballot-qualified political parties are published in the official voter information guide sent to all voters. * All candidates listed here won the Green Party's nomination for the General Election in the party's Primary Election, with the following exceptions: (a) In the 2003 Gubernatorial recall election, in which there were no party primaries for any party and all 135 candidates from all parties ran at once in the Recall Election. In that race, the candidate listed received the party's endorsement through an internal poll of its county organizations. 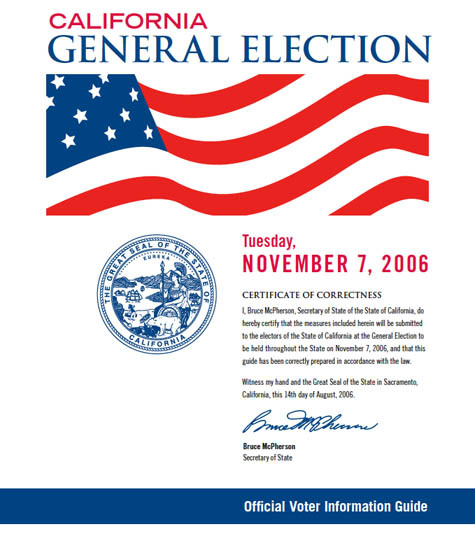 (b) In the 2004 and 2008 Presidential elections, the candidate listed was the one nominated by the Green Party of the United States Presidential Nominating Convention (in which the Green Party of California participates), rather than the candidate that finished first in the Green Party of California's Presidential Primary, as results from the Green Party's primary are not-binding according to California state law.